20% OFF now for 3 Items!Enjoy Shopping! We offer high craftsmanship handmade clothing. We seek for best high quality rich fabric and professional stitching and cutting team member to ensure every pieces of our clothing real neat and classy. "Blake" - Blake dress is V neck with ruffle neck design. "Love Potion" - is cut off back one with small bow in the middle of top back , pleated skirt. "Downtown" - Shirt collar dress design. "Crisscross" - one with crisscross back detail with swing skirt. We run all regular size XS-XL if your size is not fit well to regular one or in between you can message us to ask about custom order or to ensure to pick the best size. Be a part of your special moment. Thank you so much. Beautiful bridesmaid dresses we have made. Hello!I'm from Thailand. 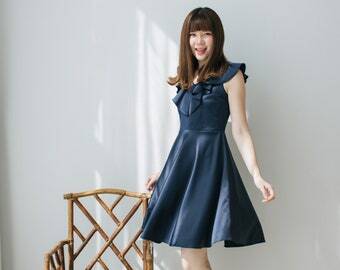 I am a professional dressmaker who start making clothing and have boutique in Thailand since I got married. I got my lovely daughters, I have my happy family. I am making clothing for live. Years have passed by, when life just get in routine everyday. I was working on just royal customer's order who love to have me taylor made clothing for them. They all are the same age as me so there were not anymore challenging in create new designs as they always need only plain shirt and skirt in the same pattern. Sure that I love to do my work and I always make my customer happy when they see their new clothing I have been made for them. One day, my daughter came to talk to me with her eagerness. She said she would like to have a boutique to sell clothing those are her own design and creation. I was asked to join her and was not hesitated. Finally, we made it! "Amordress". My daughter is working great on design and help me some production process. I do my best in all production process and help her a bit with some design tasks. We share our time, thoughts and our happiness. That changes my life. Once again I feel challenge, I feel happier. Making lovely clothing is not only making pattern, cutting, stitching them into a piece but making them as your passion, imagination, dreaming but also functional for everyday life. Let those lead your style. It's also about beautiful fabric, smart and sophisticated detail and combination. I have fun every time I help my daughter choose new fabric as of the feeling that each print on fabric has its own secret story.